When it comes to safety, having a car care kit in your vehicle helps tremendously. It provides you with the tools that you need to endure emergency situations, and it could very well be the thing that gives you solace when your car, truck, van or SUV breaks down. Deciding which items to put in your car care kit depends on your needs and preferences. For example, if you travel with infants or small children regularly, you’ll not only want to keep your vehicle stocked with water and snacks, you’ll also want to include things to entertain them with. This takes the stress out of sitting and waiting for a tow truck or for emergency car care services to arrive. It gives them something else to do while you handle the stressful situation involving your vehicle. In the event you get stuck somewhere you can’t get out easily, cat litter helps provide traction to your tires. It may seem like an odd item to carry around with you in your vehicle, but it is a necessity. The one time you need it and don’t have it is enough to make you realize this. 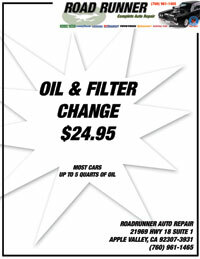 Road Runner Auto Care has got you covered. Whenever you need preventative maintenance done on your vehicle, call us. It’s always wise to travel with a car care kit. We make sure that you don’t have to use it! We’re a name you can trust. Don’t forget to send your family and friends to us. We’re here to service and repair your vehicle so that it remains in the best condition possible for you to drive regularly.